KAKIGYM is the newest gymnasium concept that is the best route to better health and fitness for the whole family. Come bring the whole gang to KAKIGYM, for a wholesome family experience. A feel good exercise centre that prides itself in providing modern facilities for the health and well-being of its members, KAKIGYM is located right within your reach. 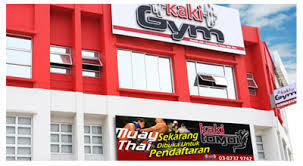 I personally havent been to Kaki Gym ,through their web page ,http://www.kakigym.com.my/ ,they have some very family oriented packages such as family package and friends package.Kaki Gym business hour will be, from 7am to 11pm midnight. Fees: Per entry rate is before 6pm is RM 10 per entry and after 6pm is RM 15. This gym got fan or Aircond? Sorry for the late reply, the workout area is not air conditioned,but the place for resting yes. berape harga masuk sekarang ? Feel free to contact them directly or email them ya.